Gladys Lam is a lively pragmatist, who thrives on solving business problems and fostering positive team efforts. When consulting on large-scale capture, analysis and management of business rules and decisions, she works comfortably with senior executives providing insights and advice. She has managed hundreds of business rule projects for Fortune 500 companies. Gladys’s expertise on business rules and decision techniques has taken her all over the globe. She speaks worldwide at conferences and other professional events. She particularly shines when mentoring and training business analysts and brainstorming with business managers. She is also Executive Director of the Building Business Capability (BBC) Conference, working to educate and develop industry professionals. She co-founded BRS with Ronald G. Ross in 1996. Since then, she has worked on many hundreds of business rule projects with a consistent focus on business engagement and business results. 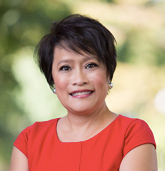 In her professional writings, Gladys is known for using tales of her mischievous daughter and large Chinese family to illustrate business rule concepts. Click here for a sample.